Elfyn Evans secured manufacturer points for his M-Sport team at the fourth round of the World Rally Championship in Portugal. 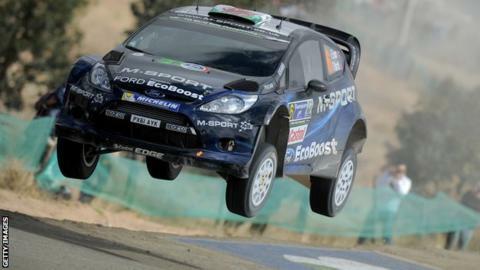 Evans' hopes were dealt a blow after he crashed his Ford Fiesta RS WRC on the fourth stage on Friday. But Evans, 25, and co-driver Daniel Barritt were able to resume and took part in the final two days of the Rally. Friday's crash meant Evans finished outside the driver points. "With the support of the team and the hard work of the guys we got back out there and had a fantastic experience over the rest of the event," Evans said. Sebastien Ogier claimed his fourth Rally de Portugal victory in five years to extend his lead in the World Rally Championship. The Championship resumes in Argentina in May and will be a new experience for Evans. "It will be our first time there so we could see a slight different approach to that rally," Evans added. "I think it will be important to get the experience of all the events for future years so looking forward to that experience."